Through FB, I meet new friends, some of them come and introduce very well to me up to the point giving their numbers to me which I think it’s not necessary. Some of them making friends as to expand their business but I hope they will not trade their own friends through FB though the Friends for Sale application was fun. *Giggles* Nevertheless, I also heard that friends quarreling through FB by removing them, and even in some relationship. FB reflects the real life, people seldom talks and come upfront, they prefer SMS or FaceBooking itself. I wonder what will happen if suddenly the world blackout, no electricity at all. I might be nuts as well. And I also wondering, from my friends list how many people personally know me? And I’m yet to accept those request yet. I hope, FB will spread Love and Peace to us and Destroy Hatred and War. Can FaceBook do that? Wishing all my friends a happy day and all the best in whatever you do. *I hope it’s not too late to say.. Happy new year 2010* [Chuckles]. I’m running out of time. I hope you always remember me no matter what happen. And yet.. 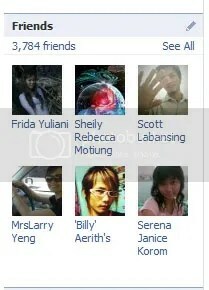 I still have 385 friends request..
Whoa! 385 friend requests? OMG! I was wondering myself too. Sometimes they rather chat and talk through Facebook than talking face-to-face or call us up. If the world blackout for years, then say bye-bye to the Net and phone calls. no facebook? no problem. 'WE' have proven that. Sarah!! I miss u! My God Too! Haha.. if blackout.. i cannot tahan because I need my phone! wakakak! sarah.. bila laa kita dapat jumpa ni.. haha..
uncle greg.. ya bah.. bayangkan kalau semua tu datang time sya kawin nanti? Banjir ni.. haha.. tidak cukup duit kami kasi makan semua..
sarah.. bila laa kita dapat jumpa ni.. haha..uncle greg.. ya bah.. bayangkan kalau semua tu datang time sya kawin nanti? Banjir ni.. haha.. tidak cukup duit kami kasi makan semua..